Many people love to drink beer on St. Patrick’s Day, but this year why not celebrate the luck of the Irish by cooking with beer as well? Delicious in everything from dessert to stew recipes, you’ll have everyone asking what your secret ingredient is. There are plenty of popular recipes that call for beer. Think about beer-battered onion rings, Guinness bread, Belgian beef carbonade and many chili recipes. The hoppy, malty flavor of beer – particularly dark brews like stouts – brings depth of flavor to many dishes and pairs particularly well with beef, yeast and chocolate. 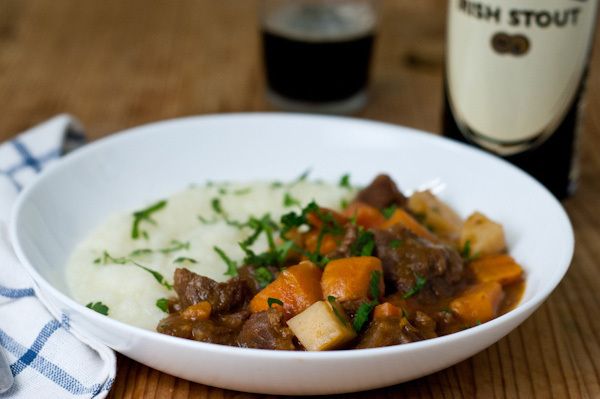 Try an Irish stout like Guinness or Murphy’s in this hearty Irish beef stew recipe. Toss the beef cubes in the flour so fully coated. Add the beef and cook, stirring often, until browned on all sides. Add the onion and garlic and cook for a few minutes. Pour in the beer and scrape up any bits from the bottom of the pan. Add the beef broth, tomato paste, Worcestershire sauce and bay leaf, and stir to combine. Bring to a simmer, and then lower the heat and cook, covered, for about two hours. Add the potatoes and turnips and allow to simmer for 1/2 hour, uncovered. Add the carrots and cook for another 15 to 20 minutes, until the meat is very tender and the carrots are softened. Season with salt and pepper and serve or allow to cool and store in the refrigerator for up to three days. The flavors only get better over time. The stew also freezes well. Serve with Irish stout or another dark beer.